A professional way to install safety wire. Twists safety wire quickly and evenly with a pull of the handle. 215mm length pliers include wire cutters. I bought these to replace my harbor freight brand ones that got stolen, These are much better. The ones from harbor freight would not cut through wire and would just bend around it because they were made with soft metal. The tusk brand cut through the wire fine without damaging themselves, and I expect them to hold up for a long time. Great quality and outstanding tool to help wire your grips! This has great contact with the wire and speeds the twisting up with confidence. Better than the local hardware store one and about the same price. Buy the kit (wire and pliers). I'm sure there may be higher quality safety wire pliers available, but I doubt any do the job any better or come close to matching the bang for the buck of these Tusks. They do what they're supposed to do and are well made enough to likely last a lifetime if cared for properly. I have searched everywhere for this tool and only found it here. I primarily use them to wire on my grips. They make a nicer twist in the wire than just using a pair of regular pliers and it's nice to have in the tool box, but definitely not a necessity. I don't think I would replace them if they got lost or broken. This works well. a lot easier to twist safety wire then plane plyers. Tusk... awesome value for the quality.. must have for anyone with a bike of any sort. Great pliers that makes wire tying anything simple. I usually stay with Snap-On tools but I tried the Tusk brand. Gets the job done and makes safety wire install easy. Good to keep while out on the trail. Great pliers. Did the job and easily. Not the best price but decent. Works good and love the price! These are the most economical I have found and work just like other brands. This tool is a must have for me. Installed around 250 sets of grips so far with one set. The wire cutter part is getting pretty dull and the point on the pliers is wearing down. But again, they have installed over 250 sets. I wish there was more of a point to the plier part and easier to lock closed. Awesome quality, easy to use, better than the old way!!! Seem to be of good quality at a good price. I have never owned another pair...so, nothing to compare them to. That being said, they work great. I use them to safety wire grips and throttle cables. I also used them to bind some electrical wires together...worked great. Should of gotten one along time ago!!! Excellent pliers for what they are intended for. For the price you couldn't ask for anything better. Do what they say and have good instructions. These were a little smaller than I expected but work just fine. They work great to installing and twisting safety wire for securing bolts, numts, and grips. I think every kid at the local track has wired their grips with these! As good or the same exact thing as the "name brand" ones also on this site. 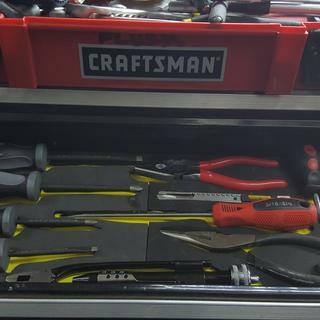 This is a must have in my toolbox/trail kit, has saved me trauma a few different times! Sure they're not as nice as a good pair of pro aviation safety wire pliers, but for the price you can't beat them. They're just as good as the more expensive "motorcycle branded" pliers out there. The Tusk Safety Wire Pliers saves time on twisting the wire manually on handle bar grips. This tool perfectly and quickly tightens the wire on the handle bar grips. You have to be careful not to over tighten the wire because the wire will snap and it will take a couple practice tries to figure out how to use the tool. Worked perfect. Have used them for years without a hitch. Quatity is A1. these pliers are just as good as many costing more. A great tool at a great price. I safety wire everything now. I never want to DNF a race over something that was preventable.